The wall divided the city of Berlin. It was dragged down and the pieces are now scattered around the world. I’m very young. What was it? 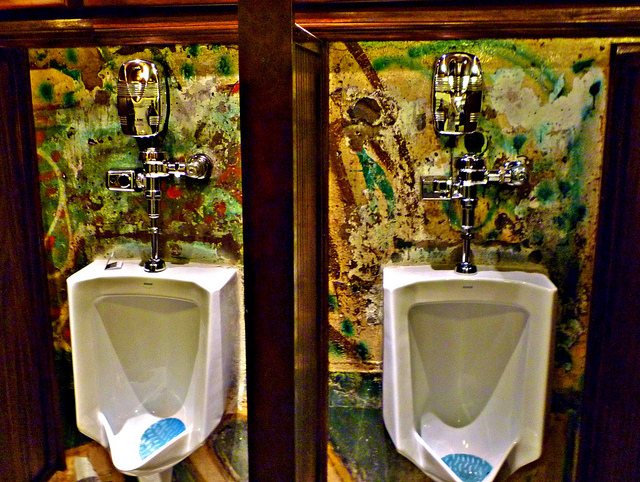 The Berlin Wall was a … well, it was a wall wasn’t it? It was in … hmm. .. ‘Berlin’. That’s the easy bit. It divided Berlin into East and West. That’s the geography bit. The political bit’s more complicated. Following the war, there were four Allied Powers supervising the reconstruction of Germany. Berlin was divided into four parts, each supervised by an Allied country. Three of them had a falling out with Russia. 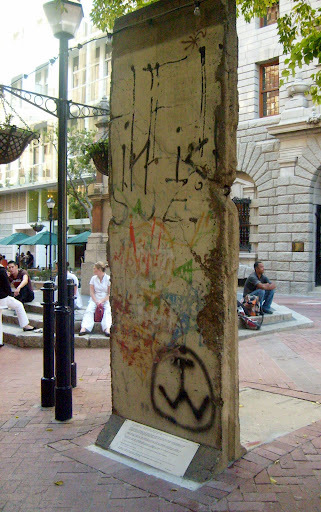 The three decided that it was time to combine the non soviet parts of Berlin for ease of reconstruction – West Berlin. Russia went it alone with its ‘piece’ – East Berlin. This essentially created a conceptual melting-pot of two opposing political philosophies; capitalism (West) and communism (East). There were then problems as some people did not consider themselves capitalist and some did not consider themselves communist. 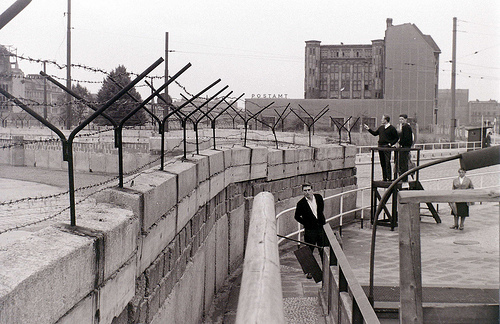 This led to people attempting to leave Eastern Berlin. The emigrants happened to be young and educated. This needed to be stopped. How to do it? A whacking big wall. Work commenced in 17 August 1961 and took approximately 3 months to build. A massive expanse of land was cleared as a ‘no man’s land’. Those attempting to escape over the wall were shot. Due to a leak of people from East Germany into a bewildered Hungary in 1989, and then into Czechoslovakia, the political ideology began to show cracks. Demonstrations began and ultimately, this led to the border between East and West being opened again. What started as a tentative, cautious souvenir collection by some, by taking bits of the wall (using chisels and sledgehammers) to ‘have their piece of history’, mushroomed into full scale demolition by mobs of sometimes angry, sometimes jubilant Germans – happy to be reunited. The wall was torn down. Some bits found themselves in entirely different parts of the world – even in different continents. Now, they stand, on quiet streets and in public parks as a symbol and reminder that attempts to segregate people with either physical or abstract barriers, can never endure. Lovely. So I’ve been patient. I’ve read that. Where’s the travel bit? Where in the world is the wall now? 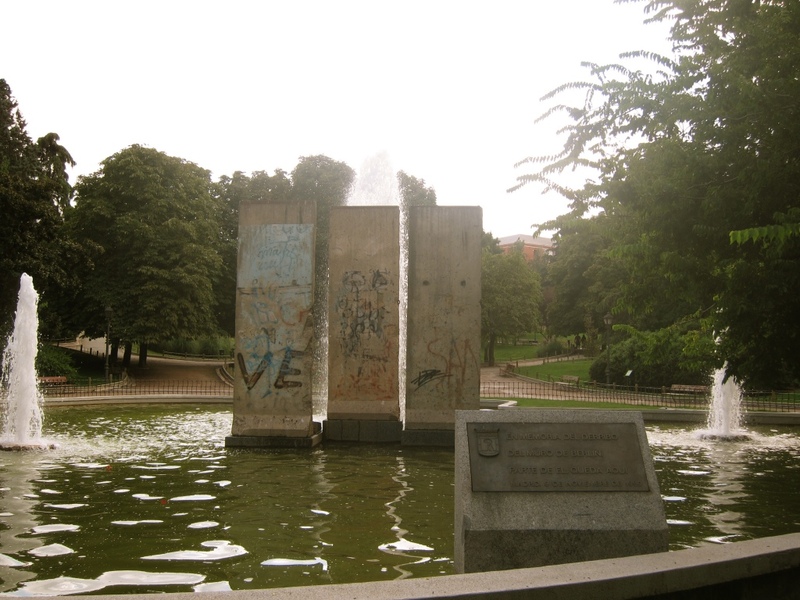 The pieces to be found in Madrid now form part of a fountain in the leafy Parque de Berlín. The plaque explains that these segments are a present from the City of Berlin to the City of Madrid.